This past month, I’ve really enjoyed diving into Charlie Cochrane’s Cambridge Fellows series. The series starts in England near the beginning of the twentieth century during the rule of King Edward VII, and it features a lovely romance between free-spirited English professor Jonty Stewart and the more uptight math professor Orlando Coppersmith. The first book, Lessons in Love, has a great start with the two protagonists’ first meeting. Jonty is new to the college faculty, and during its daily pre-dinner ritual of schmoozing in a fancily appointed room, he makes the mistake of sitting in Orlando’s favorite chair. Orlando is not happy and shows it. But Jonty’s not offended. Rather, he’s amused by Orlando rigidness and even a bit attracted to it—it’s so different from how Jonty interacts with the world. Jonty is gay—of course that’s not the word he would use back then. He’s not ashamed of it, though he’s compelled to use discretion in whom he tells, given that lying with other men is a felony under English law in that era. Fortunately, his perennial bachelorhood doesn’t raise suspicion in the all-male atmosphere of the university where so many professors are married to their studies. Orlando has always considered himself one of those intellectuals who prefers cerebral pursuits to amorous ones. He has never had any interest in women, and rarely feel sexual arousal. He is barely aware that two men can form a romantic attachment. He’s also a loner, discouraged from having friends as a child and never having learned how to do it as an adult. But the new professor intrigues Orlando and stirs feelings in him he didn’t know he could have—affection, then friendship, all combined with a nascent physical attraction that blossoms more brightly with each passing day. In today’s terms, Orlando would probably refer to himself as demisexual, but that era lacked useful terms for—or even awareness of— the many ways sexuality can express itself. And with very little knowledge of homosexuality, all Orlando knows is that he feels compelled to be near Jonty Stewart. Oh, and did I mention there’s a murder? (More than one, in fact, though I won’t spoil you too much on that front.) A college student is strangled in his dorm room for reasons that aren’t immediately apparent. The local police look into the matter, and so do Jonty and Orlando in an effort to distract themselves from the fear and gloom that have suddenly descended on the campus. I knew I would love this book almost from the first sentence. Charlie Cochrane has a remarkable ability to convey so much in a few words. From only the first two pages, I’d already learned volumes about the two lead characters, simply by how they behaved and spoke. Cochrane never had to spell out that Jonty was lighthearted but also dogged in his pursuits, or that Oliver’s gruffness belied his gentle spirit. I could just tell. And that’s the sign of a masterful writer. Besides, I’m a sucker for a good Edwardian romance. I fell in love with Edwardian novelist EM Forster in my late teens—his 1914 masterpiece Maurice is one of the first gay novels I ever read (because it’s one of the first I had access to—welcome to 1990, folks! )—and developed a soft spot for fiction about that era. Between my dog-eared copies of Forster novels and a VHS tape of the 1987 movie version of Maurice that I played so often the picture grew streaks, I managed to memorize a lot of details about the times. Cochrane pulls Edwardian England off very well. 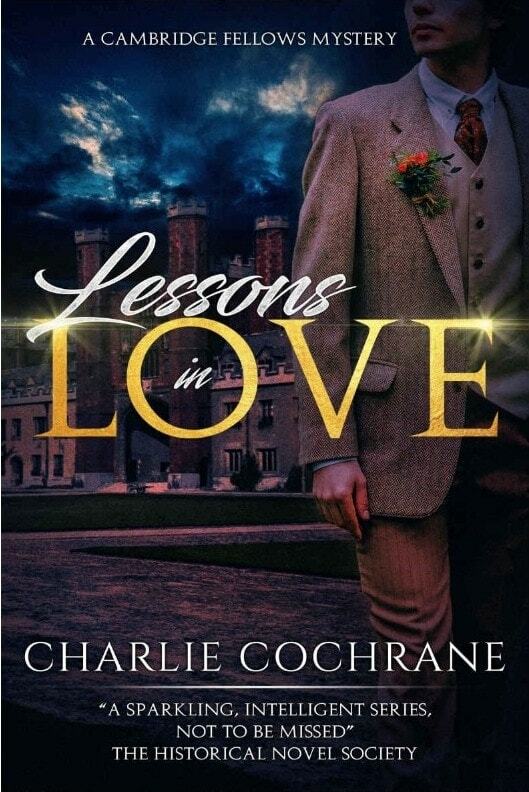 I think Lessons in Love would appeal both to regular romance readers and those who haven’t considered the genre, but enjoy character-based fiction and a well-crafted sentence. Voracious mystery readers may wonder why more of the plot isn’t focused on the mystery—or they might find Lessons in Love a nice change from their usual fare. Readers of historical fiction will be delighted by the period details and the authentic feel of the prose. And anyone who wishes EM Forster had spent more of Maurice on the love story and less on existential angst will certainly delight in this find. Not sure it’s right for you? Check out the preview below! Want to add more books to your to-be-read pile? Browse my other guest author posts, book reviews, and story snippets. To get a weekly roundup of all my posts for readers, sign up here. This post may contain affiliate links. This means that if you click on a link and make a purchase, the retailer or service provider may send me a payment equal to a small percentage of your purchase price, which I use to defray the cost of running this blog. Using these links will not increase costs to you, and in some cases will provide you with extra savings. Affiliate links do not affect how I rate books, products, or services.